Normally I’m a bit of a purist when it comes to pancakes: I like mine made simply from eggs, flour and milk, and served with nothing more than sugar and lemon. But when you start writing a food blog, some kind of transformation happens and you get all adventurous and creative, looking for new twists and takes on the old standards. Last Pancake Day I made some sublime Lemon & Ricotta Pancakes adapted from a recipe in The French Women Don’t Get Fat Cookbook by Mireille Guiliano, which helped me realise that change can be good. I am currently in training for the Bath Half Marathon. (It takes place on 3 March, I’m running it for SWALLOW Charity and you can sponsor me here! Apologies – public service announcement over!) And because I’m in training I bought a copy of Runner’s World magazine about a month ago in the hope it might inspire me. Naturally, I turned directly to the recipe section and haven’t looked at another page. I discovered in the magazine a wonderful array of healthy pancake recipes. 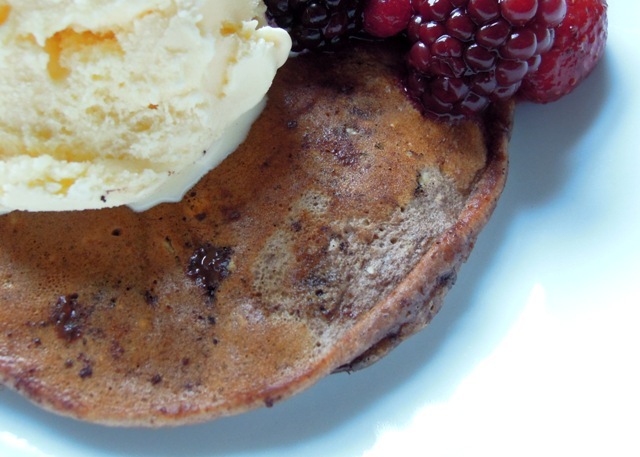 Runner’s World food writer, Pam Anderson shares her basic virtuous pancake recipe, the perfect blend of carbs and proteins required by runners containing wholewheat flour, rolled oats and buttermilk, and then goes on to offer a whole host of variations on the theme. I was rather intrigued by the chocolate version and so cooked up a batch last week. I made a few tweaks to the recipe, mainly to make them a little sweeter and lighter. Admittedly we ate ours as a pudding, topped with vanilla ice cream and winter berries, but we all thought they were absolutely delicious, if not quite as healthy as they really ought to have been. And if you’re looking for something different on Shrove Tuesday, particularly if you’re giving up chocolate for Lent, well this could be just the thing. Take a look too at the Runner’s World website where they have 40 more delicious pancake concoctions based on this same recipe. Combine the two flours, oats, sugar, salt, baking powder, cocoa and bicarbonate of soda in a large bowl. Gently whisk together the buttermilk, milk, eggs, oil and vanilla extract, pour into the dry ingredients and mix everything together well. Finally stir in the chopped chocolate. Heat a little oil in a non-stick frying pan over a medium heat. When the pan is hot, pour in a small amount of the batter – to form a small pancake roughly 10cm across. Depending on the size of your pan, you’ll probably be able to cook two or three at a time. Fry the pancakes for around two to three minutes on each side, and then keep warm while you continue working your way through the remaining batter. I served ours with winter berries and vanilla ice cream. Whipped cream, chopped nuts, sliced banana, honey and maple syrup would all make scrummy alternatives. Thank you! And good luck with your 10K too. Where and when? Good luck with the half marathon! How many of those hills does the route take? 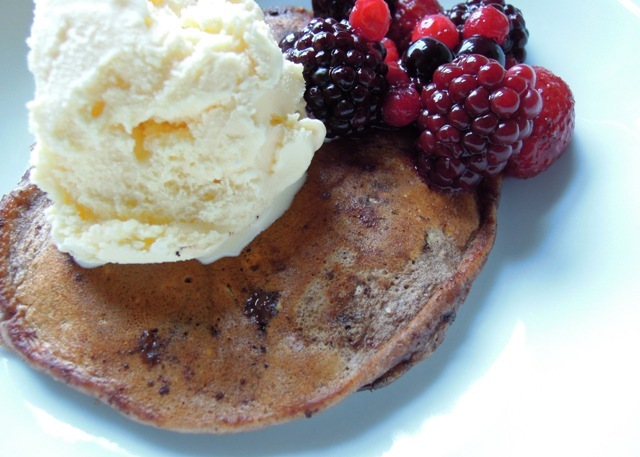 My kids love chocolate chip pancakes and this looks delicious. Thanks Virginia! I’ve been told the route doesn’t have any of the steep hills, only those sly hills that are quite gradual but go on and on and on. And you do two laps of the same course, which I imagine psychologically will present a bit of a battle. What on earth am I doing?! 🙂 Good you aren’t doing the steep ones! They are hard in a car! What a great challenge though. These look absolutely delicious! Good luck with your half marathon, I’m training for a 10k in July. Still feel so unprepared despite giving myself HEAPS of time! Wow these pancakes look lovely, and might even tempt my terrible twosome into eating anything other than the normal ones with lashings of nutella!. And good luck with the run, I’m tempted to attempt a half marathon myself this year – so far I’m running an hour about 5 times a week with no stopping, even on the steep bits. After being a lazy-layabout for far too long I’ve finally got the running bug back again, and loving it. February’s Recipes for Life challenge: what can you do with sausages, onions and tomatoes?